Flannery O'Connor was only the second twentieth-century writer (after William Faulkner) to have her work collected for the Library of America, the definitive edition of American authors. Forty years after her death, O'Connor's fiction retains its original power and pertinence. For those who know nothing of O'Connor and her work, this new study by Ralph C. Wood offers one of the finest introductions available. For those looking to deepen their appreciation of this literary icon, it cuts important new ground. Unique to Wood's approach is his concern to show how O'Connor's stories, novels, and essays impinge on America's cultural and ecclesial condition. Wood marvelously employs O'Connor's work as a window onto its own regional and religious ethos. Indeed, Wood argues here that O'Connor's fiction has lasting, indeed universal, significance precisely because it is rooted in the confessional witness of her Roman Catholicism and in the Christ-haunted character of the American South. According to Wood, it is this O'Connor -- the believer and the Southerner -- who helps us at once to confront the hardest cultural questions and to propose the profoundest religious answers to them. Thus this book is far more than a critical analysis of O'Connor's writing; in fact, the book is principally devoted to cultural and theological criticism by way of O'Connor's searing insights into our time and place. Among the pressing moral and religious questions explored are: the role of religious fundamentalism in American culture and its relation to both Protestant liberalism and Roman Catholicism; the practice of racial slavery and its continuing legacy in both the literature and religion of the South;the debate over Southern identity, especially whether it is a culture rooted in ancient or modern values; the place of preaching and the sacraments in secular society and dying Christendom; and the lure of nihilism in contemporary American culture.Characterized by a thorough knowledge of both O'Connor and the American mind, this book will fascinate and inform a wide range of readers, from lovers of literature to those seriously engaged with religious history, cultural analysis, or the American South. 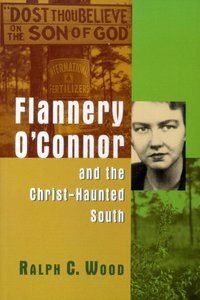 About "Flannery O'connor and the Christ-Haunted South"
Ralph C. Wood (Ph.D. University of Chicago) is University Professor of Theology and Literature at Baylor University, Waco, Texas. He serves as an editor-at-large for the Christian Century and as a member of the editorial board for the Flannery O'Connor Review. His books include The Comedy of Redemption: Christian Faith and Comic Vision in Four American Novelists, The Gospel according to Tolkien: Visions of the Kingdom in Middle-earth, Contending for the Faith: The Church's Engagement with Culture, Flannery O'Connor and the Christ-Haunted South, and most recently Preaching and Professing: Sermons by a Teacher Seeking to Proclaim the Gospel . His latest award is the Mary Ann Remick Visiting Fellowship, Center for Ethics and Culture, University of Notre Dame, where he is writing a book on G. K. Chesterton's Aesthetics and P. D. James's mystery novels during the academic year 2007-2008.